Planning a few nights away in Selemadeg? There are just 2 available hotels within 5 kilometres of the centre of town. Try to take a squiz at the Cempaka Belimbing Villas and Bali Lush. All these accommodation options are close to the main areas. If you don't mind setting up base 19 kilometres outside of the city center, explore the neighbourhood of Beraban. It's got 4 available options, such as Kriyamaha Nyanyi Villa and Natya Hotel Tanah Lot. If you find yourself needing more options in Selemadeg, look into the Legian, Bali and the Bale Gede Villas. They are located 30 kilometres and 25 kilometres away from the center. 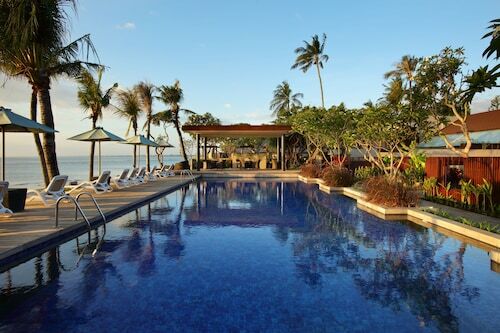 If those two don't meet your needs, you can try the Alila Villas Soori or the Peppers Seminyak. If you want to go to some close by localities, consider Tabanan and Marga. Head 14 kilometres to the southeast from Selemadeg and you'll discover Tabanan. That said, Marga is 18 kilometres to the east. Accommodations in Tabanan include The Sanyas Retreat and Villa Hati Indah. Marga choices include the Yeh Panes Bali and Rumah Desa. If you're flying into or out of Ngurah Rai International Airport and choose to stay nearby, check out the latest deals at the Four Seasons Resort Bali at Jimbaran Bay or the Temple Hill Residence Villa. How Much is a Hotel Room in Selemadeg? Hotels in Selemadeg start at AU$26 per night. Prices and availability subject to change. Additional terms may apply.